Last week I finally took Ollie and Lyle down to London for a day out. We spent the day seeing many of the city’s main sights including the London Eye. I’ve been talking about taking the boys into London for years now, but something always seemed to get in the way. It’s one of the items on my Fifty before Fifty list, because I really wanted to show them the sights of our capital city. With no major plans for the half-term week, it seemed like an excellent opportunity to finally make the journey. It was also a good opportunity to put the Samsung Galaxy S8+ through its paces. Three had kindly loaned the phone to me for my trip to Malaga. I used it to take the photos for this post, rather than carrying a separate camera. It also came in handy for checking the Tube map, finding directions for walking around the city, and even choosing where to eat! Click here to read my full review of the Samsung Galaxy S8+. The day started early with our alarms going off at 6am. The sky looked grey and cloudy, but the forecast was fairly dry for most of the day. I planned to drive down to Hillingdon Station, and then take the Tube into central London. It’s a straightforward way to get into London without negotiating the city centre traffic and paying a fortune for parking. We made it into London at about 10am and headed straight to the London Eye. 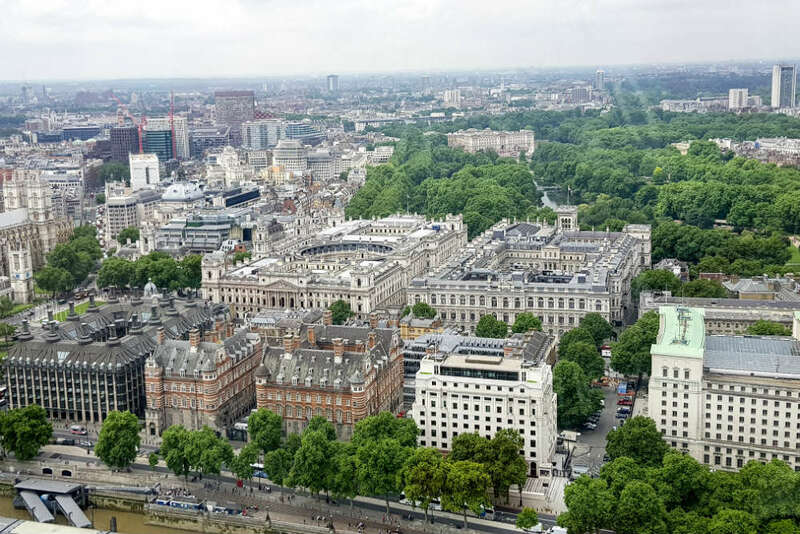 The boys and I had decided to take a ride on the London Eye at the start of the day, to get a view over the city we were going to be exploring. 365Tickets had very kindly given us tickets and so we joined the queue to get on board. The London Eye is the most popular paid tourist attraction in the UK, with over 3.75 million visitors each year! You can pay extra for Fast Track tickets, which cuts down the waiting time. But if you pick your time carefully the queues aren’t too long. Going at the start of the day usually means a shorter wait, and it was only 10-15 minutes before we were boarding. After going through security, you are put into small groups. And as a capsule approaches, the doors open and you simply step aboard. The capsules hold up to 25 people and you can move around freely during the ride. There is some seating provided in each capsule as well. I did worry that the capsule might feel a little stuffy or claustrophobic, but it was really very comfortable. The wheel glides around a full circle in around 30 minutes, giving a wonderful view over London. 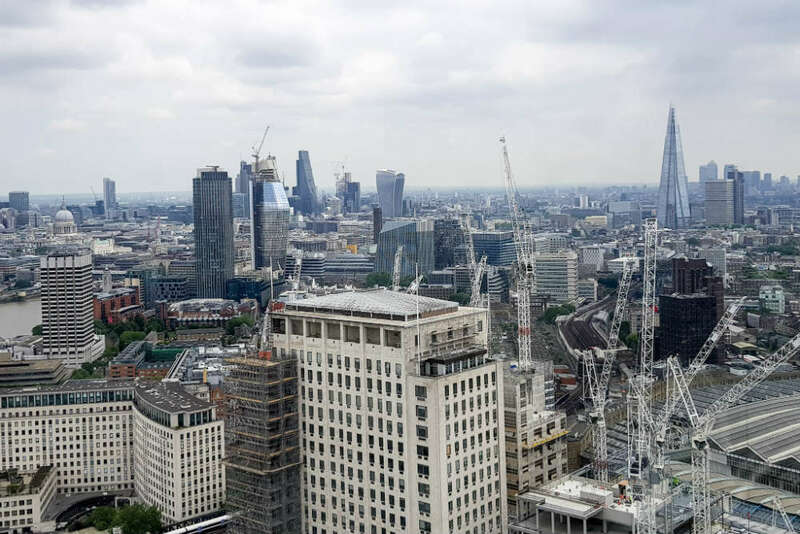 This view of the rooftops of London reminded me of the futuristic cityscape of Fritz Lang’s Metropolis. Although I’m not always great with heights, I felt really comfortable and secure in the capsule. And the view from above the city was amazing! 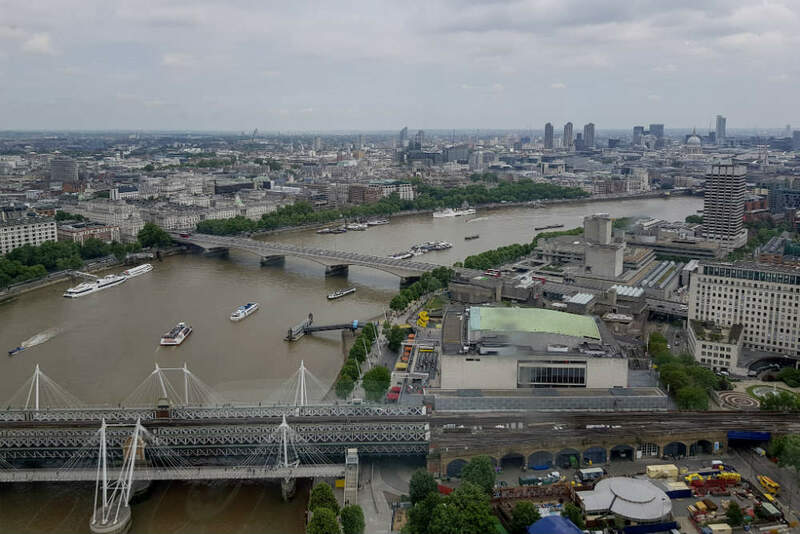 Until the viewing platform at the Shard opened, the Eye offered the highest viewpoint in London. I always love seeing a city from up on high. We went to the top of the Guinness museum when we visited Dublin, and saw Berlin from the viewing platform in the TV Tower. There are screens inside the capsules which can help you spot landmarks and give you more information as well. The boys enjoyed looking across the city, and I pointed out the landmarks that I could see. We spotted the Shard, of course, as well as St Paul’s Cathedral in the distance. Ollie also managed to spot Buckingham Palace nestled amongst the trees. There’s lots to see every direction, and we were all moving around in the capsule to take it all in. You have plenty of time to line up that perfect selfie with the London city backdrop! 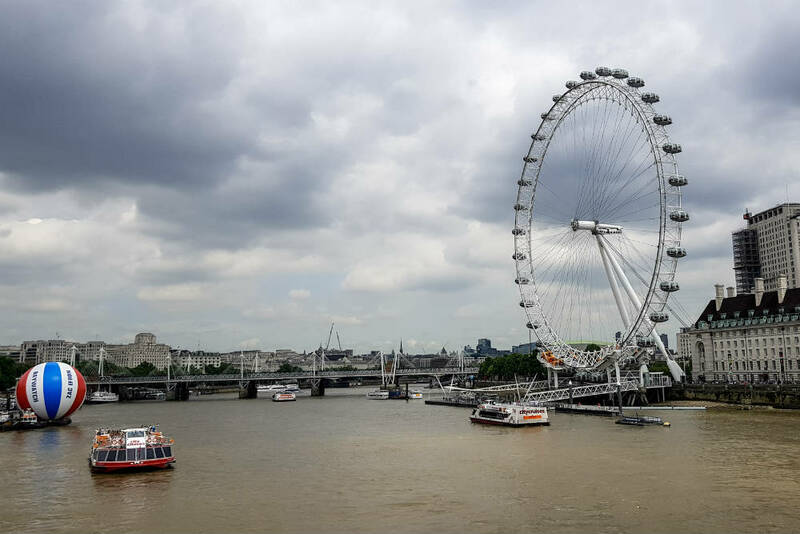 Tickets for the London Eye start from just £18.40 for a standard journey, and you can also combine it with other London attractions for greater savings. It was a fantastic way to start our day in London, and I’d highly recommend it. As our capsule glided around towards the bottom of the wheel once more, we started planning where to head next. The view of the Houses of Parliament above gave us a good starting point for the rest of the day! After crossing Westminster Bridge, we first headed towards the Houses of Parliament and Big Ben. Yes, I know it’s really the Elizabeth Tower, and I told the boys that as well. 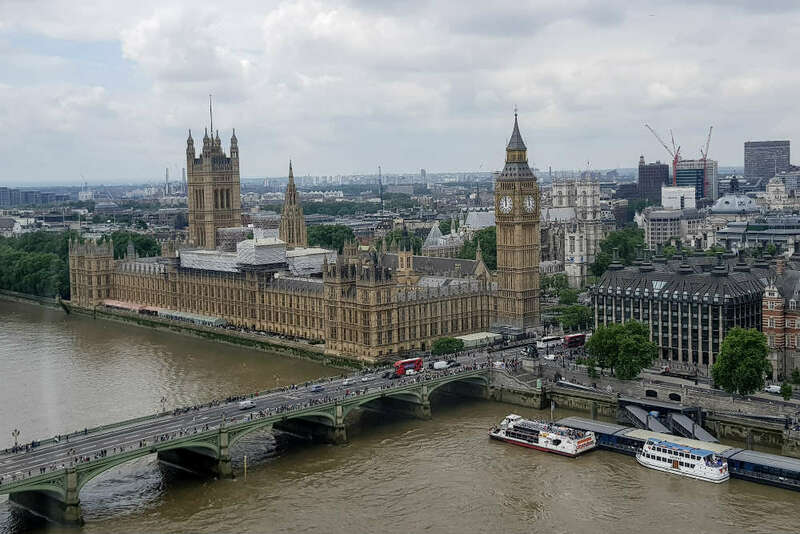 But some habits are just hard to change… There’s quite a lot of scaffolding around the Palace of Westminster at the moment, but it still looks very impressive. That was the first landmark ticked off our Tourist checklist! 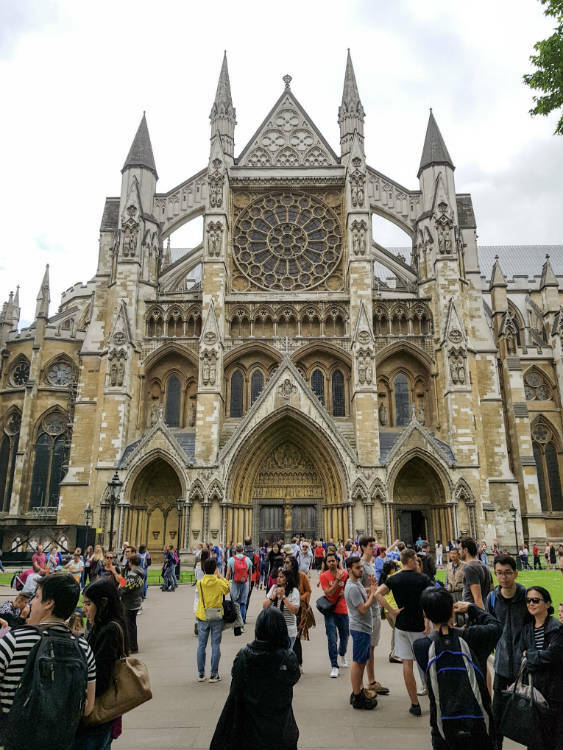 From there we took the short walk over to Westminster Abbey. I’d never visited the Abbey before, and it’s a very impressive building. Like most of the famous buildings in London, it’s very hard to get a photo without lots of other people in it! 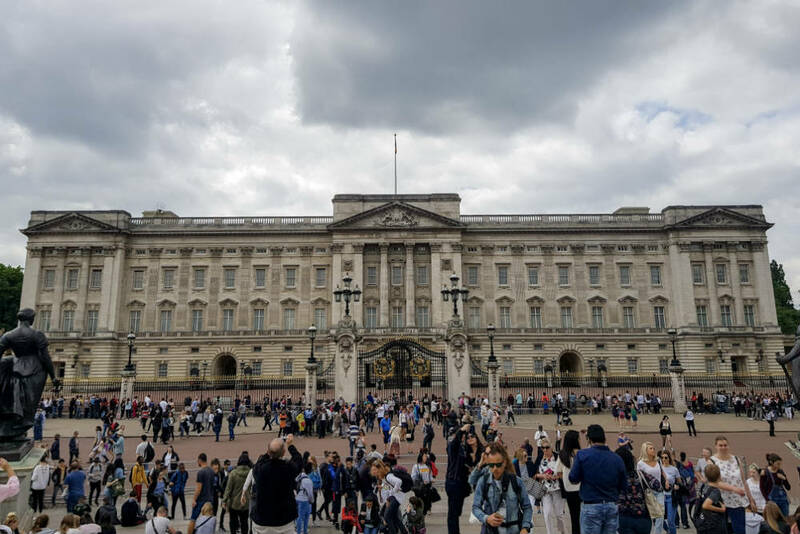 Next on our list was Buckingham Palace. We walked rather than taking the Tube, using Google Maps on the Samsung Galaxy S8+ to guide the way. It’s only a short walk and it was good to take in the hustle and bustle of the city. Before long, we turned around a corner and there was Buckingham Palace! As we expected, the crowds were pretty big – it was half term after all! 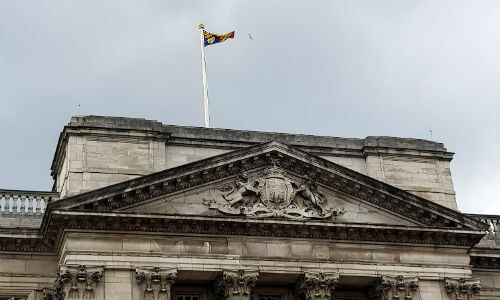 Lyle spotted that the Royal Standard was flying from the roof, which of course means that the Queen was in residence. We considered asking if we could pop in for a cuppa, but decided against it. But how to get a decent photo? Luckily, when we headed across the road to the Victoria Monument, I could just about squeeze the whole of the building into frame! While I was taking photographs, the boys took the opportunity to sit down for the first time since the Tube journey. They’ve reached that age where they don’t particularly like having their photo taken, especially Ollie. He takes after me in that way, I think. But I usually manage to get a few pictures whenever we go places together. They look a bit reluctant, don’t they? The plan after Buckingham Palace was to walk down to Marble Arch and have a bit of lunch around there. There was brief rainy spell forecast for lunchtime, so we hoped we could dodge that. The plan might have gone a little bit astray, and we might have got a little bit off-course. Seriously, I always manage to get lost somewhere, even with Google Maps to guide me! 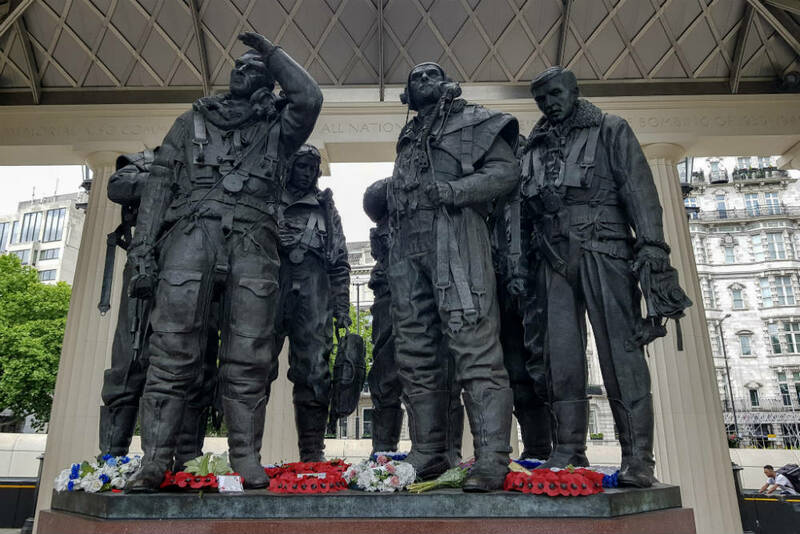 But it did mean that we saw this memorial to Bomber Command on our way past Green Park. It’s quite imposing ‘in the flesh’ – my photo doesn’t really do it justice. By the time we made it to Marble Arch, the weather had actually turned quite warm and muggy. There was no sign of rain, but we were glad to get a cold drink and rest our feet for a while! 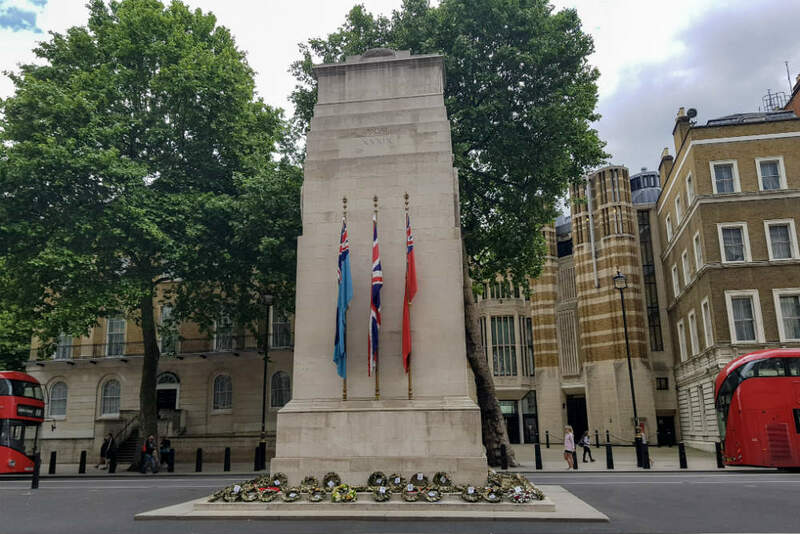 Our plan for after lunch was to head to Downing Street, via the Cenotaph, and then head up towards Trafalgar Square. 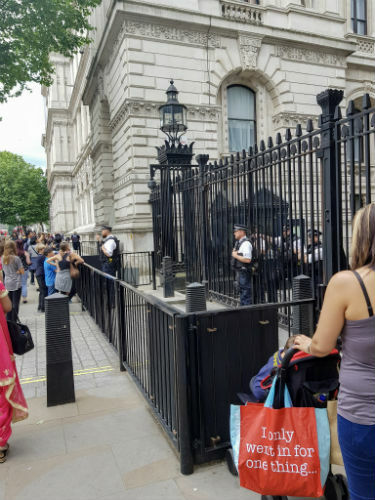 Of course, there’s not a lot that you can see at Downing Street at the best of times. And our visit was about 10 days after the attack on Manchester Arena, so security was even higher than usual. Although there was a clear police presence on the streets, it never felt over the top or obtrusive. The police do a brilliant job, and the boys and I felt completely secure throughout the day. 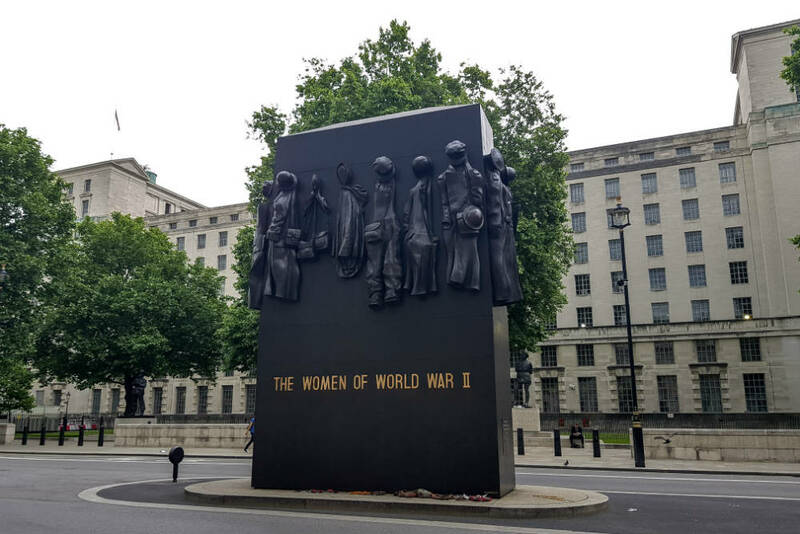 We also saw this monument to the Women of World War 2 on our walk. I hadn’t seen this one before, so I made the boys stop while I took photos. They got used to having to hang around while I wait for traffic and tourists pass by! Our last stop before Trafalgar Square was at Horseguards’ Parade. 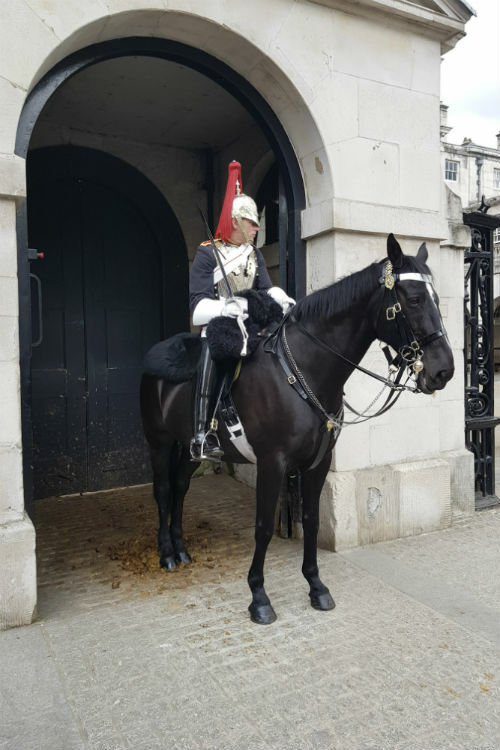 The horses on guard were of course gorgeous, and it amazes me that they are so well behaved when so many people are going up to have their photos taken by them. 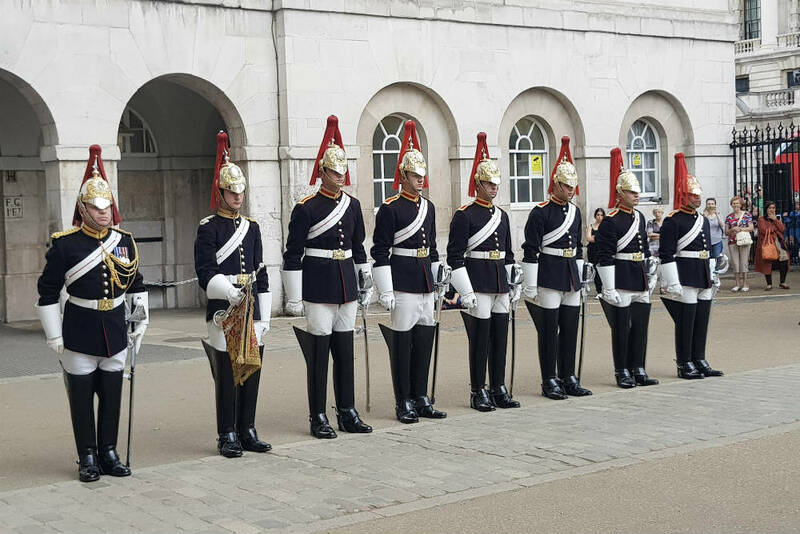 We decided to pop inside to have a quick look around the parade ground as we were going by. When we came out there was a huge amount of excitement and fuss going on, and the onlookers were all being told to stand back behind a line. When I planned our day, I didn’t realise that a ceremony takes place at Horseguards at 4pm each afternoon. The guards are all inspected and the horses taken off duty for the day. It added a little bit of unplanned pomp and ceremony to our day, and we really enjoyed watching it. 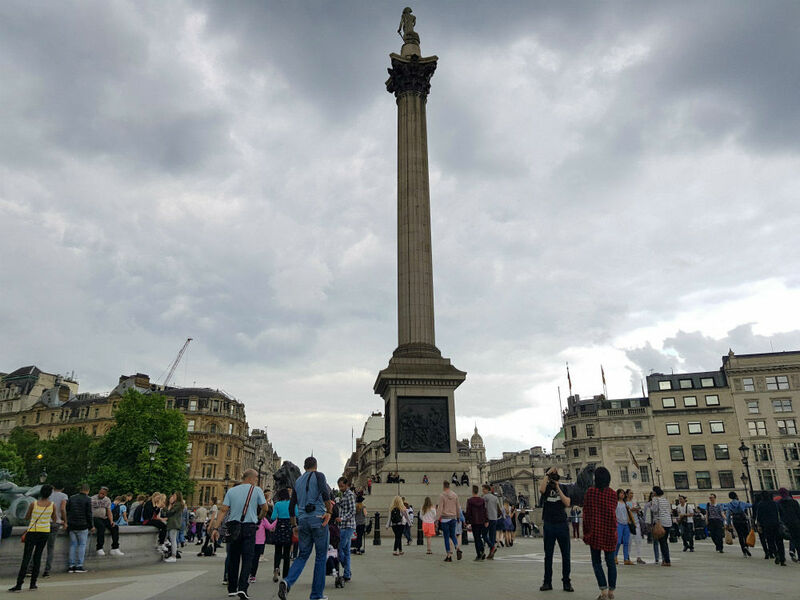 Finally we made it up to Trafalgar Square and Nelson’s Column. 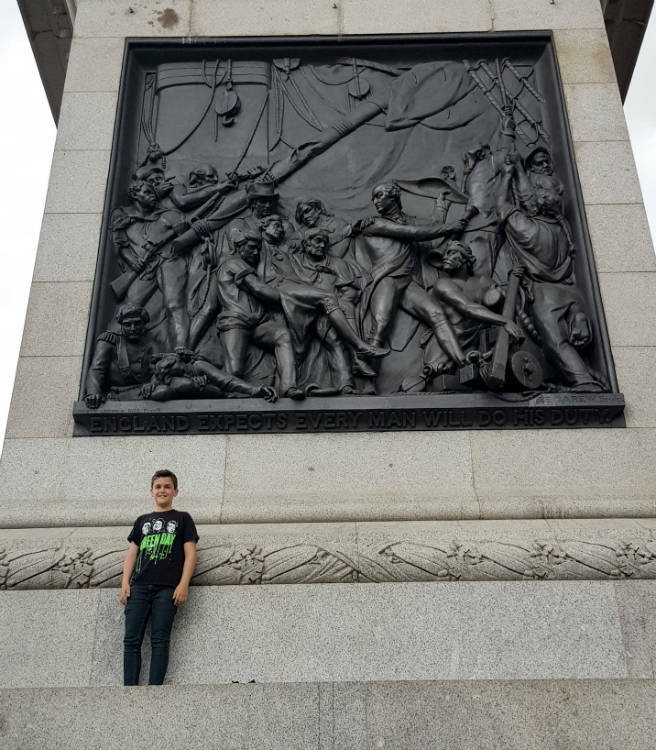 Lyle is planning to join the Navy after A levels, so it was quite cool for him to see the illustrations of Nelson’s major victories. We must pay a return visit down to HMS Victory in Portsmouth some time! I love Trafalgar Square because it’s such a vibrant, bustling area. When I was a teenager I used to visit London very regularly to stay with my older brother. The National Portrait Gallery was one of my favourite places to visit, but I didn’t take the boys in there this time. After Trafagar Square, our day was nearly at an end. We popped over to Leicester Square to watch the street artists perform, walked around China Town and had a quick bit of dinner. Afer that, we were ready to get the tube to Hillingdon and head back up the motorway to Shropshire. 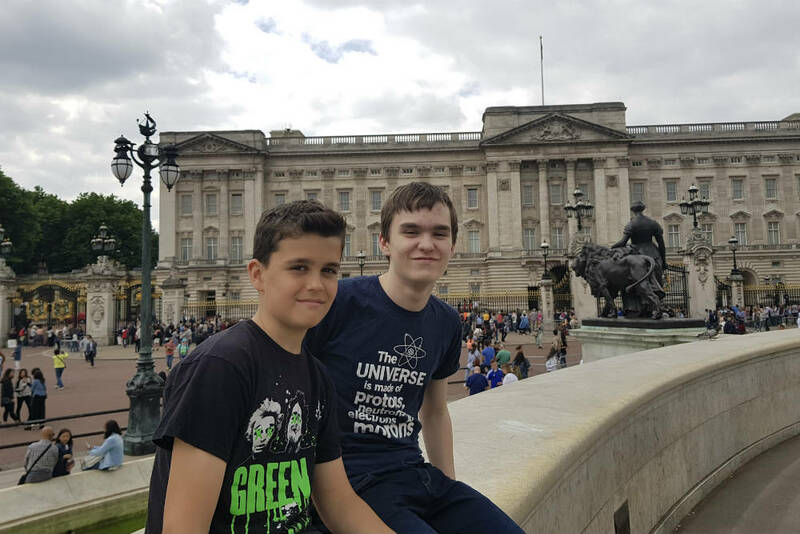 I’m so glad that the boys and I finally got to visit London together. I think the first time you visit your country’s capital city is always a bit special. 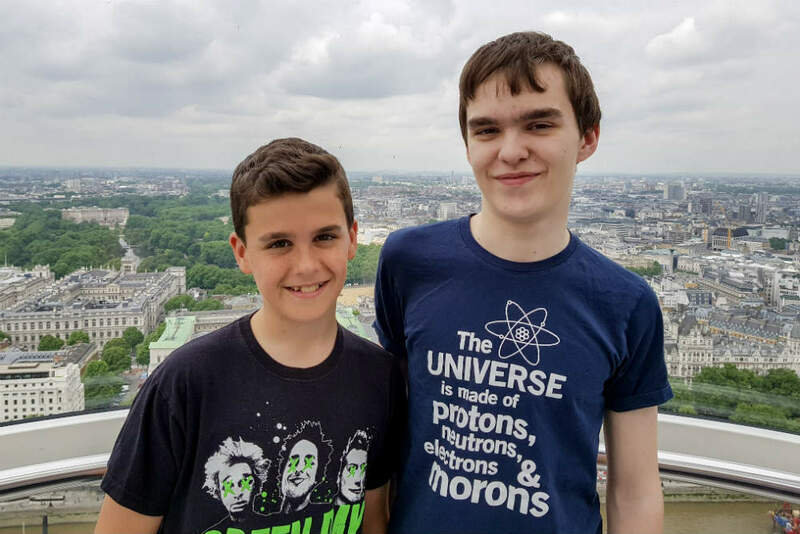 The boys loved seeing all the sights, and I loved visiting as a tourist for the first time in many years. There are still plenty of places in London that I want them to see. So I guess that gives me a good excuse to take them back again! We had a wonderful time in London, and can’t wait to explore some more. Thanks to 365Tickets for our tickets to the London Eye, which was a fantastic way to start our day! Looks like a fantastic day out and the camera photo look amazing, I got the S7 – love how the technology just seems better with time. I love China Town, use to go to a makeup school round the corner from there. There’s so much to explore in London, it’s insane. I think that would be a fantastic place to stay, right in the heart of everything! We loved the London Eye ride. It was a lovely view at the top. London is such a vibrant city. We’ve yet to go on the London Eye even though we visit London often. We’ve always been put off by the queues. Sounds like you had a great time in London visiting all the sights. The London Eye really does make a fantastic viewing platform for the skyline of London, perfect for photos. 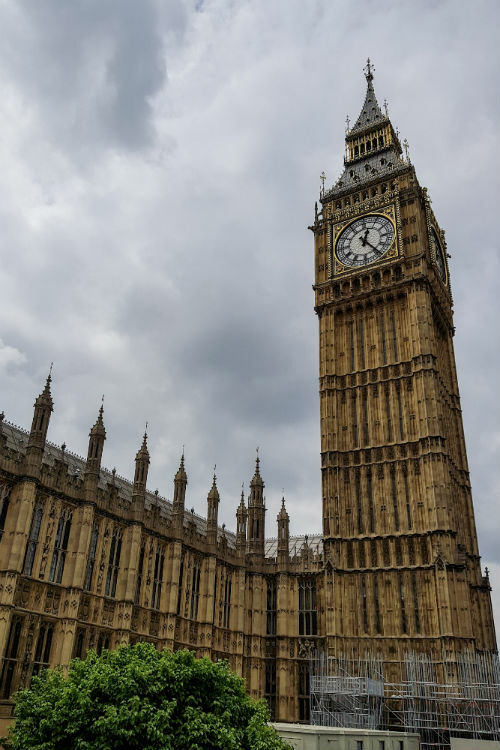 I’d really recommend going right at the start of the day – I was expecting long queues with it being half term, but we had hardly any wait at all. It’s a fantastic experience! There’s just so much to see and do – I think we could easily spend a week there, but I’d probably need another week to recover! It wasn’t as bad as I was expecting, to be honest – and it’s such a fab day out! I do love a good site seeing Day in London. Everyone should go on the Londoner at least once, but my husband still hasn’t been on it. I have never visited London, but it’s on my to-do list. I really love your photos and love the monument to the Women of World War 2, never heard of that before. I’ve yet to go on the London Eye, but I know it’s a must do. Also, the photos are quite good on the S8!